Mycoses surgeries are the root cause of fungal skin infections caused by fungi and primarily caused by three groups of fungi: dermatophytes, yeasts and moldsare. Mycoses are caused due to weakened immune systems, i.e., immunocompromised state that includes patients with HIV/AIDS and patients being treated with corticosteroids for a prolonged period. Globally, increasing prevalence of AIDS/HIV and weakened immune systems, Large Population Base, rising awareness regarding Mycoses, and Recent development in technology are the prime growth drivers of global Mycoses market. 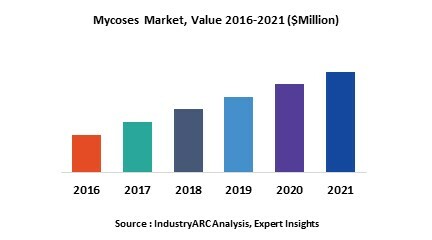 In addition, increase in adoption of Mycoses treatment, and emerging economies such as China, India and others, will create new opportunities for global Mycoses market. However, higher cost of the research and development, and risk of side effects are the key restraints for global Mycoses market. Geographically North America dominated global Mycoses market, with approximately half of the world’s procedures being done in the U.S. because of high medical reimbursement facilities, and technological advancement. Europe is projected to have fastest growth, owing to rapidly increasing prevalence AIDS/HIV, leading to weakened commune system, Population’s changing life style and environment, and modernization of healthcare infrastructure. Among all the types, Dermatophytes has the highest market share in global Mycoses market due to higher prevalence of low immune patients across the globe. This report identifies the global Mycoses market size in for the year 2014-2016, and forecast of the same for year 2021. It also highlights the market drivers, restraints, growth indicators, challenges, and other key aspects with respect to global Mycoses market.